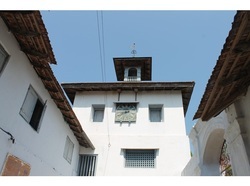 Next to the Paradesi synagogue in Mattanchery is an imposing clock tower. The clock tower was constructed in 1760 by a well-known businessman named Ezekiel Rahabi. Till 1930, the clock used to strike every hour to keep time. The clock tower, about 45 feet long, has four faces with numerals in Latin, Hebrew and Malayalam. One side is blank. The dial facing the Maharaja’s face has Malayalam numerals, the one facing the synagogue, Hebrew and the third one, Roman. Thus it helps the Maharaja, the local people, the Jews and the traders to keep time.